WE LOVE CRAFT BEER. We love craft beer, craft beer loves us, craft brewers love each other, and all is well forever and ever. Amen. That's the prayer, and it's been working. 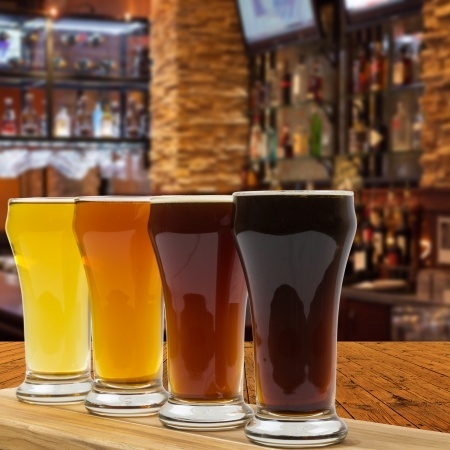 Craft beer is ubiquitous, from Michelin-starred restaurants to grimy dive bars. Its enthusiasts are voracious, educated, curious. And its brewers have managed, even amid the torrid growth, to maintain their binding spirit of independence, ingenuity, and kumbaya all-for-one-ism unseen with other businesses. Examples abound. Boston Beer Company has helped upstarts get loans and wholesale hops; breweries like Stone Brewing, Dogfish Head, Allagash, and Cigar City have collaborated on beers; and most companies have just generally been willing to lend a hand when duty calls. This April, the Center for Alcohol Policy (CAP) joins organizations across the country in recognizing Alcohol Awareness Month, a nationwide campaign recognized by the U.S. Health and Human Services Substance Abuse and Mental Health Services Administration to raise awareness of the problems that alcohol abuse can cause for individuals, their families and their communities. Ducey signs craft beer bill at Four Peaks Brewing Co.
Gov. Doug Ducey on Tuesday signed Senate Bill 1030, the Arizona Beer Bill, which allows microbrewies to expand. The bill-signing took place at Four Peaks Brewing Co., a Tempe microbrewery that makes Kilt Lifter Scottish-style ale, 8th Street Pale Ale and other popular brews. The National Beer Wholesalers Association (NBWA) – which represents the interests of America's 3,300 licensed, independent beer distributors – applauds America's craft brewers for their continued growth and entrepreneurial spirit, which adds energy and excitement to the American beer industry. According to data released this week by the Brewers Association (BA), craft brewers – as defined by BA – enjoyed continued growth during 2014 as American craft beer production volume increased 18 percent. The data suggested that craft brewers produced more than 22 million barrels of beer last year, constituting 18 percent growth for the segment. When the term microbrewery had scarcely entered the vocabulary, Rich Doyle saw possibilities. Almost three decades ago, he became a co-founder of the Boston-based Harpoon Brewery, which has grown into the 12th-largest craft beer maker in the country. Last July, with a stake of at least 40 percent in the business, he sensed it was the moment to make another move. He asked his partners to bring in an investor so the brewery could buy faltering competitors. And when they declined, he cashed out. The New Reality for Retailers: Is Consumer Choice at Risk? America now has more breweries than ever. And that might be a problem. Will Megabrew Deal Usher In A New Era For Beer? Can Capitol Hill Crush a Beer Monopoly?